Read EASY DAYSIES Archives of Older Product Reviews by TDmonthly. Watch EASY DAYSIES Archives of Older Product Videos by TDmonthly. 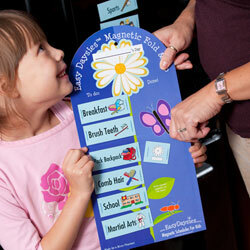 Easy Daysies™ are magnetic daily schedules for kids. 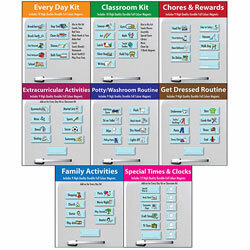 The goal of Easy Daysies™ is to help kids have easier days. 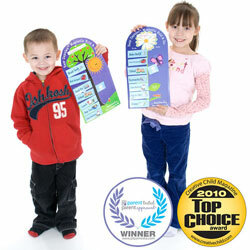 With the clear pictures and easy-to-read words, Easy Daysies™ can show your kids the “shape of the day”. Use these magnets for a single routine, like bed time or getting dressed, or plan the whole day. Learning should be fun. With Easy Daysies™ it is! A versatile, portable board for when you need a surface to attach Easy Daysies™ magnets to. Magnets can go down the middle or on each of the two columns. Great for drawers, closets, laundry rooms, etc. A fun way to get kids to put clothes away. All the magnets are made in Canada with 70% recycled material. Aside from the Starter Kit, there are NINE kits (the ninth a blank kit) to mix & match from to build the perfect family or classroom routine.